Oddly enough, Cuba was the first destination from which I created and shared instagram photos with the world (having only started using instagram in January 2013). I expected not to have access to wi-fi or internet, and while there were days and hotels without, the Melia Cohiba in Havana provided it just as you'd expect in any other country. So while I didn't have roaming (a blessing really), I could still take pictures with my phone and share them later from my hotel in Havana. "Cuba, you had me at "Dos gardenias para ti" (Ibrahim Ferrar) years before I ever laid eyes on you. At last we meet and I taste your smooth rum, smell your smoky sweet breath of cigar, and awaken to the best cup of coffee anywhere in the world. As if I could possibly fall any deeper, you throw in a shiny mint classic convertible car and the Caribbean sea. Done. Head over heels. In love." "I have to admit, it is so tempting to use a retro or sepia filter on instagram for my posts from Cuba, but the fact is this country is so colorful that not even kodachrome can do it justice. The closest thing to authentic is #nofilter, and I want to share Cuba as I see it now. Remedios, Cuba." 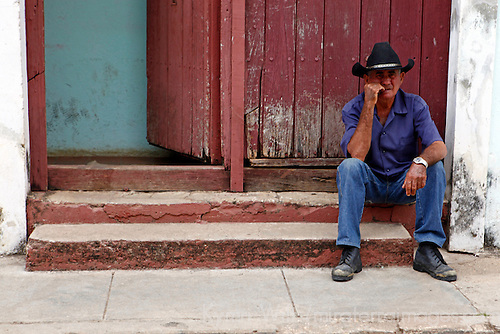 "Quiet afternoon in the #UNESCO World Heritage city of Trinidad, #Cuba." "I almost never use filters on IG, but the road to Cuban tobacco farm Finca Robaina just begged for sepia." "Tobacco leaves are hung to dry from poles in a barn at Finca Robaina, eventually to become fine Cuban cigars. #travel #Cuba #patterns"
"Don Alejandro's grandson, Hiroshi Robaina, lights for me a cigar which was rolled by his grandfather 9 years ago (he passed away in 2011). I cannot begin to describe how enjoyable it is to taste this fine aged Cuban cigar...."
Now, I'm not a smoker. I "tasted" a Cuban cigar in Cuba because I would not be opportuned with tasting one at home, and it seemed my experience of Cuba would be incomplete without this moment. It was more about honoring a host and his family than it was about the cigar. And as it turned out, this was my favorite instagram image and story of the entire trip. "Meet Lorelia, a 10-year-old girl living on a farm near Vinales, Cuba. She proudly shows off her nails she painted herself. Since I had showed her pictures of my daughter who does the same, this one is for my daughter and her friends on Instagram who share pics of nail art." Eventually, I found the perfect souvenir of my Cuba journey. "My Cuban camera, appropriately made of recycled green beer cans." "A local Cuban fishes in the waters along the Malecon as the sun sets in Havana, Cuba. #travel #sunset"
To explore more travel blogs featuring instagram, check out the set of links hosted by ToDestinationUnknown, and follow the hashtag #igtravelthursday on instagram! Such great photos. Thanks for linking up this week. Such beautiful story and images, thank you for sharing with us! Love your photos & the stories :-) Fab nails & camera, too. Sure, when in Cuba you have to try a cigar...I'm sure you didn't inhale! I really like your photos, The camera was awesome. Never been to Cuba, but I think is worth visiting the country. Your post explains it well. We were in Varadero last month. The place is little crowded with tourists, but it was in driving distance to Havana which, since we were kid-free, we really wanted to check out. Fantastic photos! I always take photos as souvenir for my jet lag free travels with my anti jet lag buddy, jetLAGFX http://www.jetlagfx.com/. I was glad hear about Cuba.